Dublin is a small manageable city, with all of the locations within easy reach of most city centre hotels and hostels. A variety of accommodation close to UCD and in the city centre is available. All accommodation offerings in the City centre and South city will be within easy reach of the conference venues. A selection of accommodation offerings is listed below. Many other options are available to suit all price points and requirements. The Talbot Hotel Stillorgan is one of Dublin’s premier four star Failte Ireland and automobile association (AA) rated hotels. They have the perfect location for the LLCA Food Org Conference being directly across the road from the UCD Campus. It is also a 10 minute direct route to Dublin City Centre, Grafton Street and St. Stephens Green. Each of the 150 air-conditioned hotel bedrooms is relaxed and inviting and offer everything that you would expect from a four star hotel including complimentary wifi internet connection. The beautiful courtyard can be found in the heart of Talbot Hotel Stillorgan and is the perfect enclosure for a quiet coffee break or an intimate chat. The Talbot Hotel Stillorgan is also served by the Dublin Airport Aircoach, on the Leopardstown Route. A limited number of rooms are available at a special conference rate on a first come first served basis. There is a courtesy shuttle bus service to the conference. The Ballsbridge Hotel offers spacious and comfortable rooms in an excellent location. It is in Dublin’s D4 district, next to the DART railway which connects guests to the city centre in minutes. The hotel is providing a shuttle service to UCD for guests. The airport’s Aircoach stop is just outside the hotel. 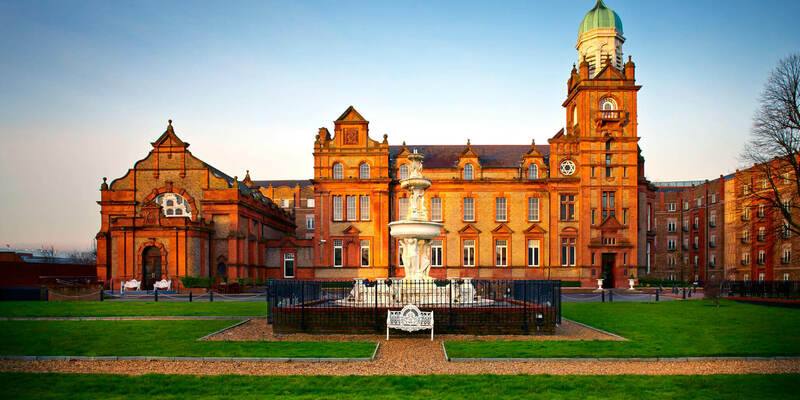 Housed in a mid-1700s estate that is now an Irish national monument, the Radisson Blu St Helen’s Hotel welcomes guests to relax amidst striking décor and historical architecture. All 151 rooms and suites feature upscale amenities, including free high-speed, wireless internet and coffee and tea provisions. Most rooms feature expansive views of the estate garden or of sparkling Dublin Bay. Near University College Dublin, this hotel is only 5 kilometres from the City Centre. The Hotel is 16 kilometres from Dublin International Airport, with an Aircoach transfer travel time of 50 minutes. An Aircoach departs the airport every 20 minutes during peak hours (Eur 8 per adult for a one-way trip to the hotel, Eur 14 return fare). An Aircoach stop is a 3-minute walk from the hotel. One of Dublin’s finest 4 star hotels in Ballsbridge Dublin 4, The Clayton hotel Ballsbridge (Formerly Bewley’s Hotel Ballsbridge) stands on the corner of Merrion Road and Simmonscourt Road in Ballsbridge, right next door to the RDS & in the heart of the business and embassy district, serviced by many bus routes and a DART system. An iconic Victorian building, Clayton Hotel Ballsbridge combines traditional elegance with contemporary design.Offering blocks of up to 120 bedrooms per night with a variety of room types to choose from. The Thomas Prior Hall has the facility to accommodate 320 theatre style, 220 banqueting style and 100 cabaret style. Overlooking 48 acres of Herbert Park in Ballsbridge, adjacent to the historic RDS and the Aviva Stadium and close to The CCD, this 4 star hotel is centrally located in Dublin. Our 153 bedrooms are luxuriously appointed with temperature controlled air conditioning, interactive TV, mini-bar, hairdryer and safe. With Deluxe Rooms, Park-view Executive Rooms and two Penthouse Suites we offer an excellent combination of rooms to suit groups. Awarded Quality Management ISO 9001:2008 since 2003. Our meeting rooms can cater for up to 170 conference delegates & dining and up to 250 for reception style hospitality event. Onsite parking available. This sophisticated boutique hotel is located in the city centre. The stylish rooms feature plush details, bold accents and handcrafted furniture. They come with free wifi, air-conditioning, flat-screen TVs and minifridges. Bathrooms have designer toiletries. The relaxed cafe lounge offers afternoon tea, and the bar is known for its whisky menu. There’s also an intimate, modern restaurant with leather furnishings that serves Irish and international dishes using local ingredients. The hotel also has a private cinema. You can travel by bus to the conference venue, UCD in just over 20 minutes. And the Dublin Airport Aircoach stops just 4 minutes away from the hotel. 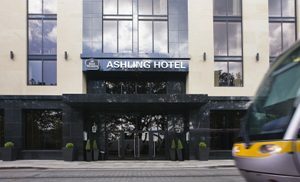 The Ashling is a stunning Dublin City hotel in a great central location adjacent to Heuston Station with Airlink Bus and on the Luas red line. An International Award Winning 4 Star hotel in Dublin City incorporating 225 beautifully appointed bedrooms, 180 seater restaurant, Chesterfields Restaurant, stylish Iveagh Bar and extensive meeting rooms and conference facilities catering for up to 220 delegates. Complimentary WiFi in public areas and all bedrooms. Car parking on site. Buswells is an elegant 3 star hotel with special character in the heart of Dublin 2. A charming 67-bedroom Georgian hotel, we are ideally located in the centre of Dublin city. A short stroll from St. Stephen’s Green, Trinity College, Grafton Street and many other visitor attractions. Our lobby entrance gives a looking glass view into the heart of the hotel with its distinctive appearance of luxury and warmth. We would like to invite you to experience our unique hospitality, where comfort and satisfaction are our priority. We offer complimentary Wi-Fi in most of our guest rooms. We are one of the oldest hotels in the city and comprise of five Georgian townhouses. Our unique hotel has operated since 1882 and remains a focal point in Dublin. The hotel comprises 251 bedrooms, which are tastefully designed and incorporate every comfort, ensuring your stay is enjoyable. Enjoy a drink or light meal in the bar, while the restaurant provides modern Irish cuisine. A health club is also on site. Secure car parking is available, as are state-of-the-art conference facilities. Free WiFi is available throughout the hotel. The Clarence is located right in the heart of Dublin. A 51 bedroom hotel, it boasts spectacular views, beautiful suites, and a host of areas which can cater for a variety of entertainment needs. The Octagon Bar is a gorgeously appointed place to relax and enjoy a drink. You can opt to dine in Cleaver East restaurant, run by Michelin star chef Oliver Dunne. The Clarence Suites can accommodate meetings and parties of varying sizes. The Penthouse is perfect for intimate get-togethers and offers guests fabulous views across the city. Also located within the complex is The Liquor Rooms, an acclaimed cocktail bar and vintage chic entertainment space. Conveniently located on Dublin’s South Quays in the heart of Dublin City, close to the River Liffey and many nearby attractions including the Convention Centre Dublin, 3Arena and the Bord Gais Energy Theatre. Clayton Hotel Cardiff Lane (formerly Maldron Hotel Cardiff Lane) is also within a short walk of city centre shopping, tourist attractions and business districts. Facilities include 304 guest rooms with complimentary Wi-Fi, STIR Restaurant, Vertigo Bar, V deli Kitchen and Lobby Bar. Club Vitae Health and Fitness Club boasts a 22-metre swimming pool, sauna, steam room, Jacuzzi, fully equipped gym and treatment rooms.